Anthem: " Forever Marshall Islands! 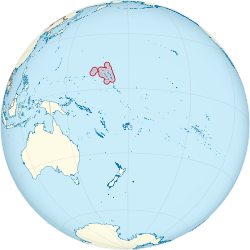 (English)"
The Marshall Islands, officially the Republic of the Marshall Islands (Marshallese : Aolepān Aorōkin M̧ajeļ), [note 1] is an island country and a United States associated state near the equator in the Pacific Ocean, slightly west of the International Date Line. Geographically, the country is part of the larger island group of Micronesia. The country's population of 53,158 people (at the 2011 Census  ) is spread out over 29 coral atolls,  comprising 1,156 individual islands and islets. The Marshallese language, also known as Ebon, is a Micronesian language spoken in the Marshall Islands. The language is spoken by about 44,000 people in the Marshall Islands, making it the principal language of the country. There are also roughly 6,000 speakers outside of the Marshall Islands, including those in Nauru and the U.S.
A maritime boundary is a conceptual division of the Earth's water surface areas using physiographic or geopolitical criteria. As such, it usually bounds areas of exclusive national rights over mineral and biological resources, encompassing maritime features, limits and zones. Generally, a maritime boundary is delineated at a particular distance from a jurisdiction's coastline. Although in some countries the term maritime boundary represents borders of a maritime nation that are recognized by the United Nations Convention on the Law of the Sea, maritime borders usually serve to identify the edge of international waters. The Federated States of Micronesia is an independent republic associated to the United States. It consists of four states – from west to east, Yap, Chuuk, Pohnpei and Kosrae – that are spread across the Western Pacific Ocean. Together, the states comprise around 607 islands that cover a longitudinal distance of almost 2,700 km (1,678 mi) just north of the equator. They lie northeast of New Guinea, south of Guam and the Marianas, west of Nauru and the Marshall Islands, east of Palau and the Philippines, about 2,900 km (1,802 mi) north of eastern Australia and some 4,000 km (2,485 mi) southwest of the main islands of Hawaii. Wake Island is a coral atoll in the western Pacific Ocean in the northeastern area of the Micronesia subregion, 1,501 miles east of Guam, 2,298 miles west of Honolulu, 1,991 miles southeast of Tokyo, and 898 miles north of Majuro. The island is an unorganized, unincorporated territory of the United States that is also claimed by the Republic of the Marshall Islands. 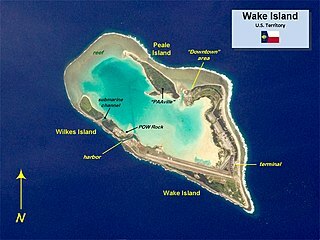 Wake Island is one of the most isolated islands in the world and the nearest inhabited island is Utirik Atoll in the Marshall Islands, 592 miles to the southeast. 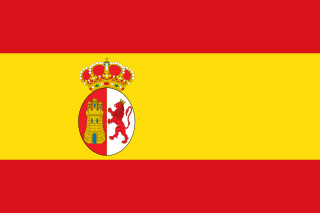 Spain claimed the islands in 1592, and the European powers recognized its sovereignty over the islands in 1874. They had been part of the Spanish East Indies formally since 1528. Later, Spain sold some of the islands to the German Empire in 1885, and they became part of German New Guinea that year, run by the trading companies doing business in the islands, particularly the Jaluit Company. 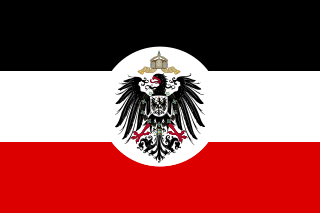 In World War I the Empire of Japan occupied the Marshall Islands, which in 1920, the League of Nations combined with other former German territories to form the South Pacific Mandate. 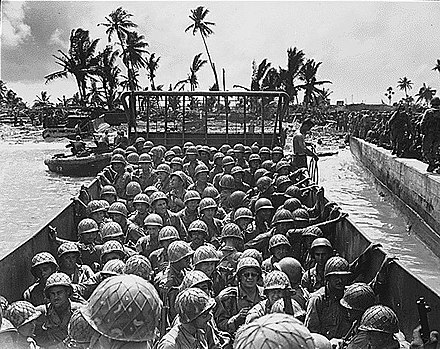 During World War II, the United States took control of the islands in the Gilbert and Marshall Islands campaign in 1944. Nuclear testing began in 1946 and concluded in 1958. The Spanish East Indies were the colonies of the Spanish Empire in Asia and Oceania from 1565 until 1899. 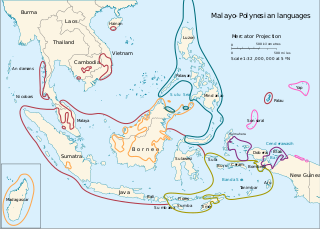 At one time or another, they included the Philippines, Marianas, Carolines, Palaos and Guam, as well as parts of Formosa (Taiwan), Sulawesi (Celebes) and the Moluccas (Maluku). The King of Spain traditionally styled himself "King of the East and West Indies". The Compact of Free Association (COFA) is an international agreement establishing and governing the relationships of free association between the United States and the three Pacific Island nations of the Federated States of Micronesia, the Marshall Islands, and Palau. These nations, together with the Commonwealth of the Northern Mariana Islands, formerly composed the Trust Territory of the Pacific Islands, a United Nations trusteeship administered by the United States Navy from 1947 to 1951 and by the U.S. Department of the Interior from 1951 to 1986. The Marshall Islands were formally claimed by Spain in 1874 through its capital in the East Indies, Manila, marking the start of several strategic moves by the Second Reich during the 1870s and 80s to annex them (claiming them to be "by chance unoccupied"  ). This policy would culminate in a tense naval episode in 1885, which did not degenerate into a conflict due to the poor readiness of Spain's naval forces and the unwillingness for open military action from the German side. From 1946 to 1958, it served as the Pacific Proving Grounds for the United States and was the site of 67 nuclear tests on various atolls. The world's first hydrogen bomb, codenamed "Mike", was tested at the Enewetak atoll in the Marshall Islands on November 1, (local date) in 1952, by the United States. There are two tertiary institutions operating in the Marshall Islands, the College of the Marshall Islands  and the University of the South Pacific. ↑ Wake Island is claimed as a territory of the Marshall Islands, but is also claimed as an unorganized, unincorporated territory of the United States, with de facto control vested in the Office of Insular Affairs (and all military defenses managed by the United States military). The government of the Marshall Islands is the largest employer, employing 30.6% of the work force, down by 3.4% since 1988. GDP is derived mainly from payments made by the United States under the terms of the amended Compact of Free Association. Direct U.S. aid accounted for 60% of the Marshall Islands' $90 million budget. The economy combines a small subsistence sector and a modern urban sector. Majuro is the capital and largest city of the Marshall Islands. It is also a large coral atoll of 64 islands in the Pacific Ocean. It forms a legislative district of the Ratak (Sunrise) Chain of the Marshall Islands. 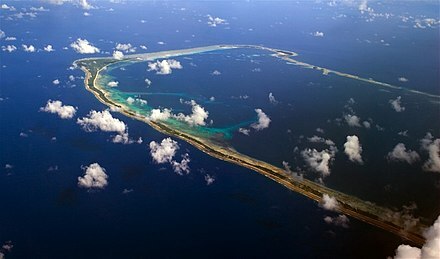 The atoll has a land area of 9.7 square kilometres (3.7 sq mi) and encloses a lagoon of 295 square kilometres (114 sq mi). As with other atolls in the Marshall Islands, Majuro consists of narrow land masses. Kwajalein Atoll is part of the Republic of the Marshall Islands (RMI). The southernmost and largest island in the atoll is named Kwajalein Island, which its majority English-speaking residents often called by the shortened name, Kwaj. The total land area of the atoll amounts to just over 6 square miles (16 km2). It lies in the Ralik Chain, 2,100 nautical miles (3900 km) southwest of Honolulu, Hawaii. Mili Atoll is a coral atoll of 92 islands in the Pacific Ocean, and forms a legislative district of the Ratak Chain of the Marshall Islands. It is located approximately 78 kilometres (48 mi) southeast of Arno. Its total land area is 14.9 square kilometres (5.8 sq mi) making it the second largest of the Marshall Islands after Kwajalein. It encloses a much smaller lagoon than Kwajalein, with an area of 760 square kilometres (290 sq mi). The atoll is separated by a water channel called the Klee Passage from the Knox Atoll which is considerably smaller. The population of Mili Atoll was 738 as of 2011. The main village is also called Mili. Other villages include Nallu, Enejet, Lukonor, Tokewa, and Wau, Mili. Nallu, Enejet and Lukonwor are only accessible from Mili by land during lowtide. Only Mili, Mili and Enejet, Mili have runways for small aircraft. Mili Airport and Enejit Airport are served by Air Marshall Islands when its aircraft are operational. Arno Atoll is a coral atoll of 133 islands in the Pacific Ocean, and forms a legislative district of the Ratak Chain of the Marshall Islands. Its total land area is only 5 square miles (13 km2). Unlike most other atolls, Arno encloses three different lagoons, a large central one, and two smaller ones in the north and east. Its main lagoon encloses an area of 130.77 square miles (338.7 km2). At a distance of only 20 kilometres (12 mi), it is the closest atoll to the Marshall Islands capital, Majuro Atoll, and can be seen looking east from Majuro on a clear day at low tide. 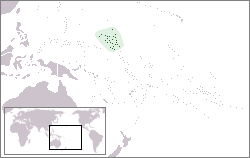 The population of Arno Atoll was 1,794 at the 2011 census. The most populous islets are Ajeltokrok, Kobjeltak, Rearlaplap, Langor and Tutu. The largest village is Ine, Arno. Ebeye is the most populous island of Kwajalein Atoll in the Marshall Islands, as well as the center for Marshallese culture in the Ralik Chain of the archipelago. Settled on 80 acres of land, it has a population of more than 1500. Over 50% of the population is estimated to be under the age of 18. Amata Kabua was the first president of the Marshall Islands from 1979 to 1996. Kili Island or Kili Atoll is a small, 81 hectares island located in the Marshall Islands in the Pacific Ocean. It is the temporary home of 548 inhabitants who are descended from islanders who originally lived on Bikini Atoll. They were relocated when they agreed to let the U.S. government temporarily use their home for nuclear testing in 1945. Kili Island became their home after two prior relocations failed. The island does not have a natural lagoon and cannot produce enough food to enable the islanders to be self-sufficient. It is part of the legislative district of the Ralik Chain of the Marshall Islands. The island is approximately 48 kilometers (30 mi) southwest of Jaluit. It is one of the smallest islands in the Marshall Islands. The Legislature of the Marshall Islands has 33 members, elected for a four-year term in single-seat and five multi-seat constituencies. The last election was November 21, 2011. Elections in the Marshall Islands are officially nonpartisan, but most members of the Nitijeļā are affiliated with one of the four active political parties in the Marshall Islands: Aelon Kein Ad (AKA), Kien Eo Am (KEA), United People's Party (UPP), and United Democratic Party (UDP). The government of the Marshall Islands operates under a mixed parliamentary-presidential system as set forth in its Constitution. Elections are held every four years in universal suffrage, with each of the twenty-four constituencies electing one or more representatives (senators) to the lower house of RMI’s unicameral legislature, the Nitijela. The President, who is head of state as well as head of government, is elected by the 33 senators of the Nitijela. Four of the five Marshallese presidents who have been elected since the Constitution was adopted in 1979 have been traditional paramount chiefs. Iroij Litokwa Tomeing was the President of the Marshall Islands from January 2008 until October 2009. The following is an alphabetical list of topics related to the Republic of the Marshall Islands. Japanese settlement in the Marshall Islands was spurred on by Japanese trade in the Pacific region. 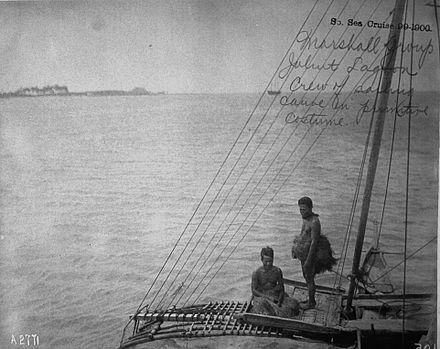 The first Japanese explorers arrived in the Marshall Islands in the late 19th century, although permanent settlements were not established until the 1920s. As compared to other Micronesian islands in the South Pacific Mandate, there were fewer Japanese who settled in the islands. After the Japanese surrender in 1945, the Japanese populace were repatriated to Japan, although people of mixed Japanese–Marshallese heritage remained behind. They form a sizeable minority in the Marshall Islands' populace, and are well represented in the corporate, public and political sectors in the country. Jurelang Zedkaia was a Marshallese politician and Iroijlaplap. He served as the President of the Marshall Islands from 2009 to 2012. He was elected as the country's 5th head of state on October 26, 2009, following the ouster of his predecessor, Litokwa Tomeing, in the country's first successful vote of no confidence. Leroij Atama Zedkaia was the Marshallese paramount chief, or Leroijlaplap, of Majuro. Leroij Zedkaia spearheaded the movement to break the Marshall Islands away from the rest of the Trust Territory of the Pacific Islands and form the independent Republic of the Marshall Islands. She was also the mother of Jurelang Zedkaia, who has served as the President of the Marshall Islands from 2009 to 2012. 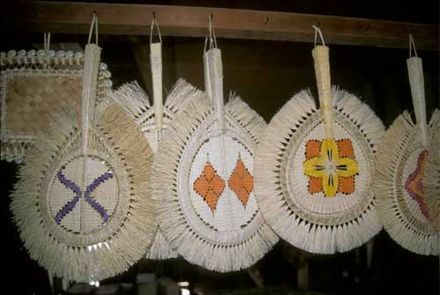 Leroij is a title by a female paramount chief, or Leroijlaplap, in the Marshall Islands. Christopher Jorebon Loeak is a Marshallese politician who was the President of the Marshall Islands from 2012 to 2016. He was elected by parliament as President in January 2012, following the 2011 general election. Hilda Cathy Heine is a Marshallese educator and politician, currently serving as the eighth President of the Marshall Islands. Prior to assuming office, she served as the Minister of Education. She was the first individual in the Marshall Islands to earn a doctorate degree, and the founder of the women's rights group Women United Together Marshall Islands (WUTMI). Casten Ned Nemra is a Marshallese politician who was President of the Marshall Islands for 17 days in January 2016. He was elected by the Nitijeļā (Parliament) as President in January 2016, following the 2015 general election, narrowly defeating Senator Alvin Jacklick, a seven-term member of Parliament, by a 17–16 vote. He was the youngest person to hold the job and the second commoner. He was ousted by a vote of no confidence after just two weeks in office by the opposition for jumping ship and joining Iroij Mike Kabua's Aelon Kein Ad party along with Senators Dennis Momotaro and Daisy-Alik Momotaro. ↑ The largest cities in Marshall Islands, ranked by population Archived September 3, 2011, at the Wayback Machine . population.mongabay.com. Retrieved May 25, 2012. 1 2 3 "Marshall Islands Geography". CIA World Factbook. ↑ User, Super. "Members". rmiparliament.org. Retrieved August 22, 2017. 1 2 "Republic of the Marshall Islands 2011 Census Report" (PDF). Prism.spc.int. Retrieved August 22, 2017. ↑ "Marshall Islands Population (2017) - Worldometers". Worldometers.info. Retrieved August 22, 2017. 1 2 3 4 5 "Marshall Islands profile - Timeline". Bbc.com. July 31, 2017. Retrieved August 22, 2017. 1 2 3 "Republic of the Marshall Islands". Pacific RISA. Retrieved November 1, 2015. ↑ Liao, Shannon (2018-05-23). "The Marshall Islands replaces the US dollar with its own cryptocurrency". The Verge. Retrieved 2019-01-16. ↑ "Marshall Islands to issue own sovereign cryptocurrency". Reuters. 2018-02-28. Retrieved 2019-01-16. ↑ The History of Mankind Archived September 27, 2013, at the Wayback Machine by Professor Friedrich Ratzel, Book II, Section A, The Races of Oceania page 165, picture of a stick chart from the Marshall Islands. MacMillan and Co., published 1896. ↑ Palacio Atard, Vicente (1969). "LA CUESTION DE LAS ISLAS CAROLINAS. UN CONFLICTO ENTRE ESPAÑA Y LA ALEMANIA BISMARCKIANA" (PDF). Archived (PDF) from the original on July 9, 2018. ↑ Corral, Carlos (1995). El conflicto sobre las Islas Carolinas entre España y Alemania (1885): la mediación internacional de León XIII. Editorial Complutense. ISBN 9788474914849. ↑ "Caroline Islands | Encyclopedia.com". www.encyclopedia.com. Retrieved 2019-01-16. ↑ "Marshall Islands marks 71 years since start of US nuclear tests on Bikini". Radio New Zealand. 2017-03-01. Retrieved 2019-01-16. ↑ France-Press, Agence (March 1, 2014). 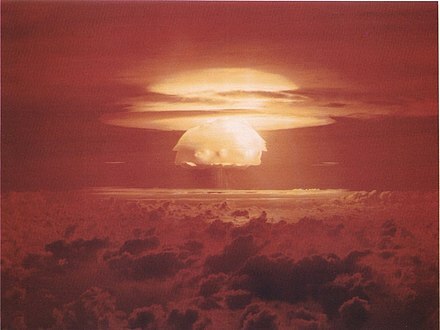 "Bikini Atoll nuclear test: 60 years later and islands still unliveable". The Guardian . Retrieved August 22, 2017. ↑ "Rising seas could threaten $1 billion Air Force radar site". www.cbsnews.com. Retrieved 2019-01-16. 1 2 3 "Geography". Rmiembassyus.org. Archived from the original on November 15, 2013. Retrieved August 22, 2017. 1 2 Beardslee, L. A. (1870). Marshall Group. North Pacific Islands. Washington DC: U.S. Government Printing Office. p. 33. Retrieved November 1, 2015. ↑ Alcalay, Glenn; Fuchs, Andrew. "History of the Marshall Islands". atomicatolls.com. Retrieved January 7, 2017. ↑ "Vast shark sanctuary created in Pacific". BBC News. October 3, 2011. Retrieved November 25, 2011. ↑ "Enen Kio (a.k.a. Wake Island) • Marshall Islands Guide". Marshall Islands Guide. 2016-12-16. Retrieved 2019-01-16. ↑ Julia Pyper, ClimateWire. "Storm Surges, Rising Seas Could Doom Pacific Islands This Century". Scientific American. ↑ "The Marshall Islands Are Disappearing". The New York Times . December 2, 2015. ↑ Stephen, Marcus (November 14, 2011). "A sinking feeling: why is the president of the tiny Pacific island nation of Nauru so concerned about climate change?". The New York Times . Retrieved February 9, 2015. ↑ Peter Meligard (December 28, 2015). "Perishing oO Thirst In A Pacific Paradise". Huffington Post. Archived from the original on December 29, 2015. Retrieved December 28, 2015. 1 2 "Kwajalein Atoll Causeway Project, Marshall Islands, USA Permit Application, Discharge of Fill Material: Environmental Impact Statement". August 22, 1986. p. 23. Retrieved August 22, 2017. ↑ Bryan, E.H. (1965). Life in Micronesia: Birds of the Marshalls. Kwajalein, Marshall Islands: Kwajalein Hourglass. 1 2 "Animals in Marshall Islands". Listofcountriesoftheworld.com. Retrieved August 22, 2017. ↑ dos Reis, M.A.F. (2005). "Chondrichthyan Fauna from the Pirabas Formation, Miocene of Northern Brazil, with Comments on Paleobiogeography". Anuário do Instituto de Geociências. 28: 31–58. 1 2 3 4 Bryan, E.H. (1965). Life in Micronesia: Marshall Island Insects, Part 1. Kwajalein, Marshall Islands: Kwajalein Hourglass. ↑ "Salticidae". World Spider Catalog. Natural History Museum Bern. Retrieved April 10, 2017. ↑ Gwynne, S.C. (5 October 2012). "Paradise With an Asterisk". Outside Magazine. Retrieved 9 August 2013. ↑ Schulte, Bret (July 4, 2012). "For Pacific Islanders, Hopes and Troubles in Arkansas". The New York Times . ↑ David Vine (2006). "The Impoverishment of Displacement: Models for Documenting Human Rights Abuses and the People of Diego Garcia" (PDF). Human Rights Brief. 13 (2): 21–24. Archived from the original (PDF) on February 8, 2013. ↑ David Vine (January 7, 2004) Exile in the Indian Ocean: Documenting the Injuries of Involuntary Displacement. Ralph Bunche Institute for International Studies. Web.gc.cuny.edu. Retrieved on September 11, 2013. ↑ David Vine (2006). Empire's Footprint: Expulsion and the United States Military Base on Diego Garcia. ProQuest. p. 268. ISBN 978-0-542-85100-1. ↑ David Vine (2011). Island of Shame: The Secret History of the U.S. Military Base on Diego Garcia (New in Paper). Princeton University Press. p. 67. ISBN 978-0-691-14983-7. ↑ "Culture of Marshall Islands - history, people, traditions, women, beliefs, food, family, social, dress". www.everyculture.com. Retrieved 2019-01-16. ↑ "Marshall Islands | Map, Flag, History, & Facts". Encyclopedia Britannica. Retrieved 2019-01-16. ↑ "The World Factbook: Marshall Islands". cia.gov. Central Intelligence Agency. June 28, 2017. Retrieved July 10, 2017. Look under tab for "People and Society". 1 2 3 4 International Religious Freedom Report 2009: Marshall Islands Archived January 19, 2012, at the Wayback Machine . 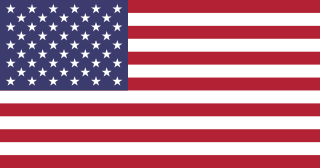 United States Bureau of Democracy, Human Rights and Labor (September 14, 2007). This article incorporates text from this source, which is in the public domain. ↑ "Constitution of the Marshall Islands". Paclii.org. Archived from the original on January 2, 2011. Retrieved October 25, 2015. ↑ Giff Johnson (November 25, 2010). "Huge funeral recognizes late Majuro chief". Marianas Variety News & Views . Archived from the original on July 14, 2011. Retrieved November 28, 2010. ↑ Amanda Levasseur, Sara Muir (2018-08-01). "USCGC Oliver Berry crew sets new horizons for cutter operations". Dvidshub . Retrieved 2018-08-09. In July Oliver Berry's crew set a new milestone by deploying over the horizon to the Republic of the Marshall Islands. The 4,400 nautical mile trip marked marking the furthest deployment of an FRC to date for the Coast Guard and is the first deployment of its kind in the Pacific. ↑ Davenport, Coral; Haner, Josh (December 1, 2015). "The Marshall Islands Are Disappearing". The New York Times . Retrieved August 22, 2017. ↑ General Assembly – Overall Votes – Comparison with U.S. vote Archived June 26, 2017, at the Wayback Machine lists the Marshall Islands as the country with the second highest incidence of votes. Micronesia has always been in the top two. ↑ Armin Rosen (April 29, 2015). "Marshall Islands ship seized by Iran – Business Insider". Business Insider. ↑ "Iran to release cargo vessel after it pays fine – Business Insider". Business Insider. May 6, 2015. ↑ "Football". oceaniafootball.hpage.com. Retrieved 2018-09-06. ↑ "Marshall Islands Baseball / Softball Federation - Marshall Islands National Olympic Committee - SportsTG". SportsTG. Retrieved 2018-09-06. ↑ "Marshall Islands Economy 2017, CIA World Factbook". Theodora.com. Retrieved August 22, 2017. 1 2 3 "Republic of the Marshall Islands : 2016 Article IV Consultation-Press Release; Staff Report; and Statement by the Executive Director for Republic of the Marshall Islands". Imf.org. Retrieved August 22, 2017. ↑ "Marshall Islands to issue own sovereign cryptocurrency". Reuters. Retrieved March 5, 2018. ↑ Galbraith, Kate (June 3, 2015). "Marshall Islands, the Flag for Many Ships, Seeks to Rein In Emissions". The New York Times. ISSN 0362-4331. Archived from the original on January 4, 2018. Retrieved January 3, 2018. ↑ "Marshall Islands - The Shipping Law Review - Edition 4 - The Law Reviews". thelawreviews.co.uk. Archived from the original on January 4, 2018. Retrieved January 3, 2018. ↑ Hand, Marcus (March 22, 2017). "Marshall Islands becomes the world's second largest ship registry". Seatrade Maritime News. Archived from the original on August 15, 2017. Retrieved January 3, 2018. ↑ Kopel, David (May 1, 2015). "U.S. treaty obligation to defend Marshall Islands ships". Washington Post. ISSN 0190-8286. Archived from the original on January 4, 2018. Retrieved January 3, 2018. 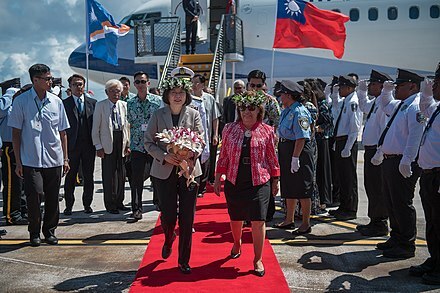 ↑ "How the Marshall Islands became a top U.S. crude export destination". Reuters. August 12, 2016. Archived from the original on January 4, 2018. Retrieved January 3, 2018. ↑ "Republic of the Marshall Islands becomes 181st ILO member State". Ilo.org. July 6, 2007. Archived from the original on July 24, 2008. 1 2 "Official Homepage of the NITIJELA (PARLIAMENT)". NITIJELA (PARLIAMENT) of the Republic of the Marshall Islands. ↑ "COMPACT OF FREE ASSOCIATION AMENDMENTS ACT OF 2003" (PDF). Public Law 108–188, 108th Congress. December 17, 2003. Archived from the original (PDF) on October 26, 2007. ↑ Mellgard, Peter (2015-12-12). "In The Marshall Islands, Traditional Agriculture And Healthy Eating Are A Climate Change Strategy". Huffington Post. Retrieved 2019-01-16. ↑ "Copra Processing Plant • Marshall Islands Guide". Infomarshallislands.com. November 18, 2016. Retrieved August 22, 2017. ↑ "Copra production up on 2014 - The Marshall Islands Journal". Marshallislandsjournal.com. October 9, 2015. Archived from the original on August 14, 2017. Retrieved August 22, 2017. ↑ Speedy, Andrew. "Marshall Islands". Fao.org. Archived from the original on April 17, 2016. Retrieved August 22, 2017. ↑ "Marshall Islands' Majuro is world's tuna hub". Undercurrent News. Retrieved January 5, 2018. ↑ "Majuro Tuna Plant Exports World-Wide". U.S. Embassy in the Republic of the Marshall Islands. November 23, 2012. Archived from the original on January 6, 2018. Retrieved January 5, 2018. ↑ "Pacific Islands look to coconut power to fuel future growth". afp.google.com. September 13, 2007. Archived from the original on January 13, 2008. Retrieved October 25, 2015. ↑ College of the Marshall Islands: Reiher Returns from Japan Solar Training Program with New Ideas Archived October 28, 2012, at the Wayback Machine . Yokwe.net. Retrieved September 11, 2013. ↑ "Republic of the Marshall Islands". Rep5.eu. Archived from the original on May 10, 2013. Retrieved October 25, 2015. 1 2 McMurray, Christine and Roy Smith. Diseases of Globalization: Socioeconomic Transition and Health. Routledge, October 11, 2013. ISBN 1134200226, 9781134200221. p. 127. ↑ College of the Marshall Islands (CMI) Archived April 27, 2013, at the Wayback Machine . Cmi.edu. Retrieved on September 11, 2013. ↑ "Republic of the Marshall Islands – Amata Kabua International Airport". Republic of the Marshall Islands Ports Authority. ↑ "Airlines Serving the Marshall Islands - RMIPA". Rmipa.com. Retrieved August 22, 2017. ↑ "Radio Majuro 979 - Listen Radio Majuro 979 online radio FM - Marshall Islands". Topradiofree.com. Retrieved August 22, 2017. ↑ "V7AA - 96.3 FM Uliga Radio Online". radio.gjoy24.com. Retrieved August 22, 2017. ↑ "Marshall Islands country profile". Bbc.com. July 31, 2017. Retrieved August 22, 2017. ↑ "Hot Radio Station • Marshall Islands Guide". Infomarshallislands.com. September 27, 2016. Retrieved August 22, 2017. 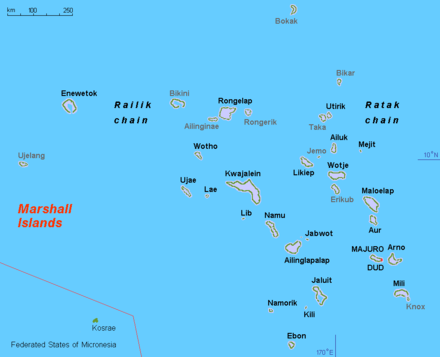 ↑ "Marshall Islands: Radio Station Listings". Radiostationworld.com. Retrieved August 22, 2017. ↑ "Micronesia Heatwave 1557 - Listen Micronesia Heatwave 1557 online radio FM - Marshall Islands". Topradiofree.com. Retrieved August 22, 2017. ↑ "Marshall Islands profile - Media". Bbc.com. July 31, 2012. Retrieved August 22, 2017. ↑ "Marshall Islands facts, information, pictures - Encyclopedia.com articles about Marshall Islands". Encyclopedia.com. Retrieved August 22, 2017. 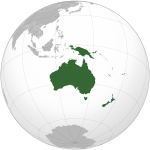 ↑ "AUSTRALIA-OCEANIA : MARSHALL ISLANDS". Cia.gov. Retrieved August 22, 2017. ↑ "Internet Options • Marshall Islands Guide". Infomarshallislands.com. June 11, 2017. Retrieved August 22, 2017. ↑ Hasegawa. "MHTV". Ntamar.net. Retrieved August 22, 2017. ↑ Hasegawa. "About Us". Minta.mh. Retrieved August 22, 2017. Barker, Holly M. (2012-02-01). Bravo for the Marshallese: Regaining Control in a Post-Nuclear, Post-Colonial World. Cengage Learning. ISBN 9781111833848. "Marshall Islands". The World Factbook . Central Intelligence Agency.